Venezuela's self-declared interim president Juan Guaidó has said his family has been threatened, amid the country's continuing political crisis. In a speech at Venezuela's Central University, he said police had visited his family home looking for his wife. But major powers Russia and China have backed President Nicolás Maduro. 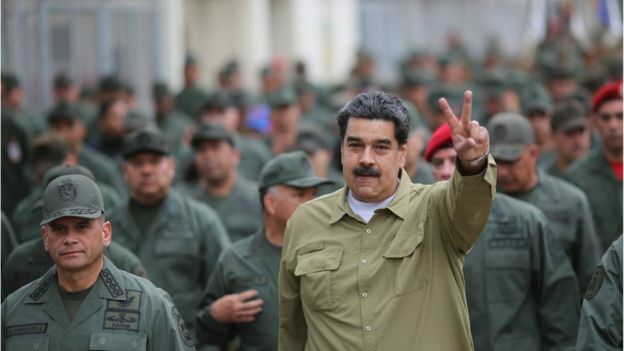 Military support is seen as crucial to Mr Maduro's hold on power. 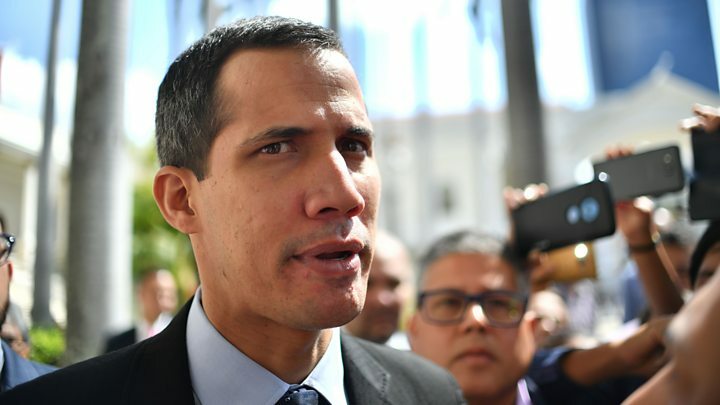 But Mr Guaidó says he has held secret meetings with the military to win support for ousting Mr Maduro. "Right now, special forces were at my home asking for Fabiana," said the opposition leader during a speech at the university, announcing his plan for the country. "The dictatorship thinks they will frighten us. I received this information before I came here. But I didn't start with that. I started with a plan for all Venezuelans." Mr Guaidó called for the "re-establishment of public services", measures to tackle the worsening humanitarian crisis and support for the "most vulnerable sectors" of the economy. "We want a child who is born in any Venezuelan state to aspire to as much as, or more, than any child who lives in Madrid, Barcelona or Bogota or in any other part of the world," he said. He called on Venezuelans to gather together on Saturday as part of fresh protests to demand "humanitarian assistance." The European Union's foreign policy chief, Federica Mogherini, said that the EU had agreed to create a contact group aimed at resolving the crisis. UK Foreign Secretary Jeremy Hunt is expected to urge EU nations to impose sanctions on key figures in Mr Maduro's government on Thursday, after also speaking to Mr Guaidó on Wednesday.